One of my favorite guilty pastimes is heading over to Twitter or Instagram and catching up on my daily celebrity news. It’s so easy to get lost in all the glamour, fashion and beauty of celebrity lives. They have endless VIP parties to attend, luxurious clothes to dress up in, and exotic vacations to the most extravagant locations to travel to. Looking at all these celeb lives can have you drooling with fomo or wishing you could get paid 500,000 dollars just to post about the latest fad product. 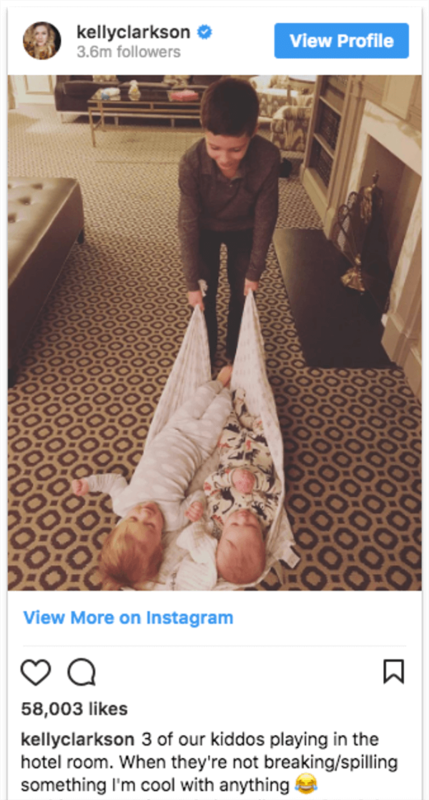 Sometimes though, celebrities show they are just like us, especially when they become parents. With the exception of some of their interesting names for their kids (can you believe a celeb named their baby Audio Science?!) 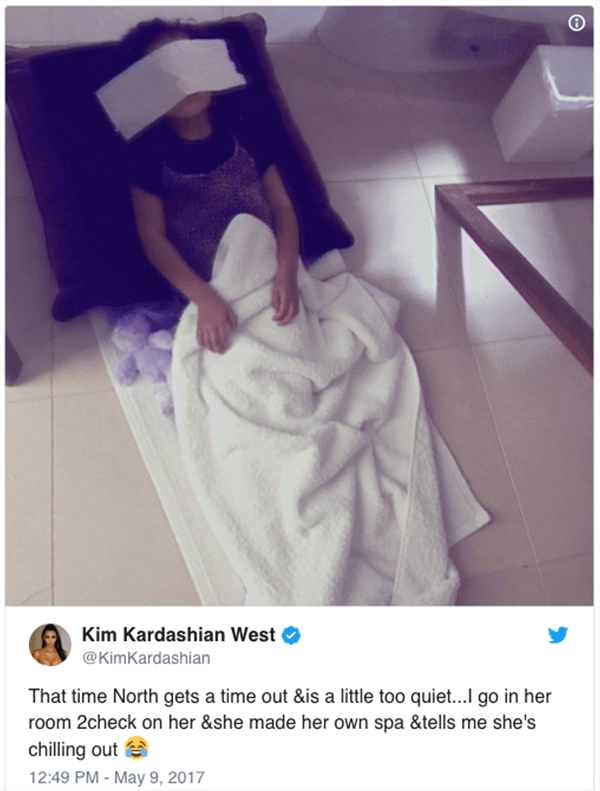 celebrity parents also deal with tantrums, picky eaters, and kids that just won’t sleep like we do. Here are my top 10 funny tweets and Instagram posts celebs have written about their kids from the past few years. 1. Tyra Banks showing us that even supermodel moms need to decide sometimes between precious shower alone time and baby chores. 2. Kelly Clarkson’s little ones are definitely winning this mommy quiet time war. Sometimes we will let our kids do the silliest things just for a moment of peace, and celebs are no different! 3. Little Northie decided she was done with regular timeout and ready for some spa time instead to calm herself. No doubt she’s imitating her celebrity mom just like our own kids love to imitate us. And seriously, we can’t ignore this super cute version of time out! 4. “How did my sweet child cause all that mess?” is something I’ve wondered time and time again. 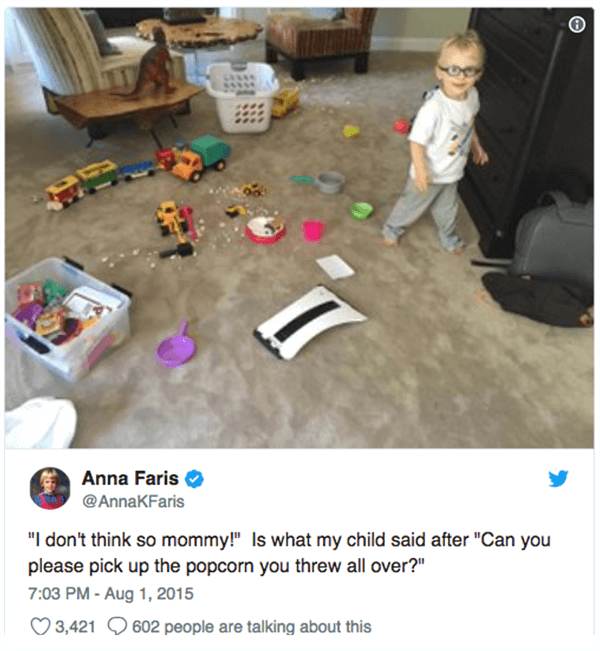 And as Anna Farris shows, even celebrities deal with their child saying “no, no!” to cleaning up requests! 5. 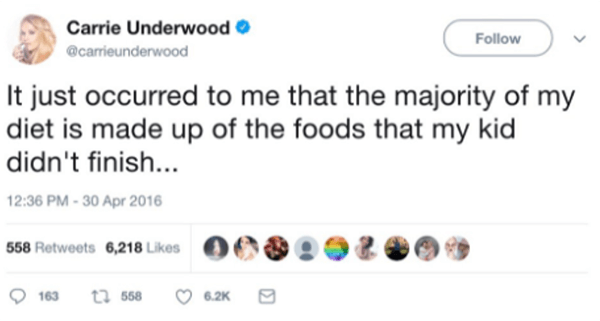 Moms and dads can definitely relate to Carrie Underwood’s post about a parent’s inevitable diet: eating our kids’ leftovers such as fruit snacks, animal crackers and everything in between, while out and about with our little ones. 6. 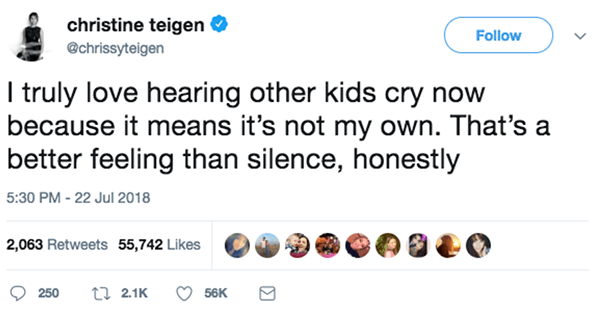 Chrissy Teigen always has us cracking up and loving her real mom humor. She keeps it real no matter what! 7. Dads and moms can really relate to this. Why do our little ones never sleep when we want them to? This one by Chris Pratt made us laugh out loud! 8. 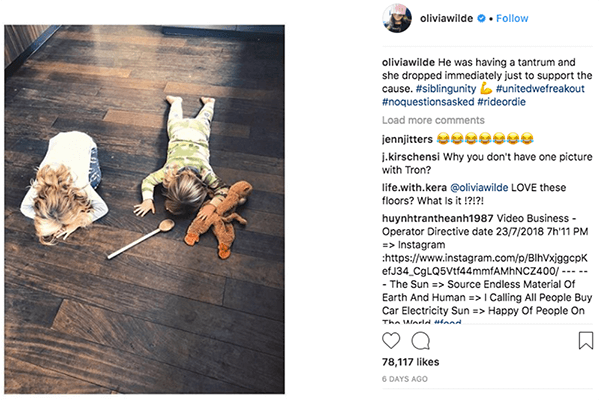 There’s nothing more heartwarming than watching children love and support their siblings, even when it’s us they’re banding against, like Olivia Wilde’s little ones, who were united in this extreme parenting sport called tantrum-ing. 9. Ryan Reynolds’s tweets always have us laughing out loud on his take of fatherhood, with his relatable sense of humor and fun. 10. Sometimes getting your little one out the door feels like a never-ending battle, as we are reminded by Nicole Richie. Maybe we should have sent her some Kudo Banz for busy mornings! 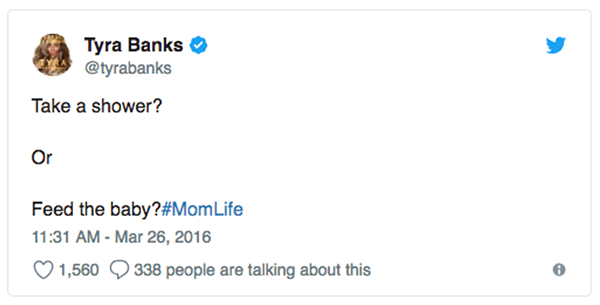 We hope you enjoyed these funny celebrity parents’ tweets and Instagram posts that remind us even glamorous people have real life parenting moments.